While free-standing portrait painting diminished in Rome, the art of the portrait flourished in Roman sculptures, where sitters demanded realism, even if unflattering. During the 4th century, the sculpted portrait dominated, with a retreat in favor of an idealized symbol of what that person looked like. (Compare the portraits of Roman Emperors Constantine and Theodosius) In the Late Antique period the interest in an individual likeness declined considerably, and most portraits in late Roman coins and consular diptychs are hardly individualized at all, although at the same time early Christian art was evolving fairly standardized images for the depiction of Jesus and the other major figures in Christian art, such as John the Baptist, and Saint Peter. Most early medieval portraits were donor portraits, initially mostly of popes in Roman mosaics, and illuminated manuscripts, an example being a self-portrait by the writer, mystic, scientist, illuminator, and musician Hildegard of Bingen (1152). As with contemporary coins, there was little attempt at a likeness. Stone tomb monuments spread in the Romanesque period. Between 1350-1400, secular figures began to reappear in frescos and panel paintings, such as in Master Theodoric's Charles IV receiving fealty, and portraits once again became clear likenesses. 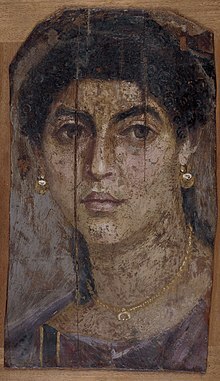 Around the end of the century, the first oil portraits of contemporary individuals, painted on small wood panels, emerged in Burgundy and France, first as profiles, then in other views. The Wilton Diptych of ca. 1400 is one of two surviving panel portraits of Richard II of England, the earliest English King for whom we have contemporary examples. Leading Early Netherlands masters of the portrait included Jan van Eyck, Robert Campin and Rogier van der Weyden. Portraits of donors began to be shown as present, or participate in the main sacred scenes shown, and in more private court images subjects even appeared as significant figures such as the Virgin Mary. Many innovations in the various forms of portraiture evolved during this fertile period. The tradition of the portrait miniature began, which remained popular until the age of photography, developing out of the skills of painters of the miniatures in illuminated mauscripts. Profile portraits, inspired by ancient medallions, were particularly popular in Italy between 1450 and 1500. Medals, with their two–sided images, also inspired a short-lived vogue for two-sided paintings early in the Renaissance. Classical sculpture, such as the Apollo Belvedere, also influenced the choice of poses utilized by Renaissance portraitists, poses that have continued in usage through the centuries. Northern European artists led the way in realistic portraits of secular subjects. The greater realism and detail of the Northern artists during the 15th century was due in part to the finer brush strokes and effects possible with oil colours, while the Italian and Spanish painters were still using tempera. Among the earliest painters to develop oil technique was Jan van Eyck. Oil colors can produce more texture and grades of thickness, and can be layered more effectively, with the addition of increasingly thick layers one over another (known by painters as ‘fat over lean’). Also, oil colors dry more slowly, allowing the artist to make changes readily, such as altering facial details. Antonello da Messina was one of the first Italians to take advantage of oil. Trained in Belgium, he settled in Venice around 1475, and was a major influence on Giovanni Bellini and the Northern Italian school. During the 16th century, oil as a medium spread in popularity throughout Europe, allowing for more sumptuous renderings of clothing and jewelry. Also affecting the quality of the images, was the switch from wood to canvas, starting in Italy in the early part of the 16th century and spreading to Northern Europe over the next century. Canvas resists cracking better than wood, holds pigments better, and needs less preparation―but it was initially much scarcer than wood. Leading German portrait artists including Lucas Cranach, Albrecht Durer, and Hans Holbein the Younger who all mastered oil painting technique. Cranach was one of the first artists to paint life-sized full-length commissions, a tradition popular from then on. At that time, England had no portrait painters of the first rank, and artists like Holbein were in demand by English patrons. His painting of Sir Thomas More (1527), his first important patron in England, has nearly the realism of a photograph. Holbein made his great success painting the royal family, including Henry VIII. Dürer was an outstanding draftsman and one of the first major artists to make a sequence of self-portraits, including a full-face painting. 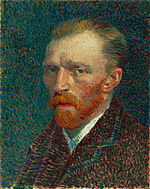 He also placed his self-portrait figure (as an onlooker) in several of his religious paintings. Dürer began making self-portraits at the age of thirteen. Later, Rembrandt would amplify that tradition. In Venice around 1500, Gentile Bellini and Giovanni Bellini dominated portrait painting. They received the highest commissions from the leading officials of the state. Bellini's portrait of Doge Loredan is considered to be one of the finest portraits of the Renaissance and ably demonstrates the artist's mastery of the newly arrived techniques of oil painting. Bellini is also one of the first artists in Europe to sign their work, though he rarely dated them. Later in the 16th century, Titian assumed much the same role, particularly by expanding the variety of poses and sittings of his royal subjects. Titian was perhaps the first great child portraitist. After Titian succumbed to the plague, Tintoretto and Veronese became leading Venetian artists, helping the transition to Italian Mannerism. The Mannerists contributed many exceptional portraits that emphasized material richness and elegantly complex poses, as in the works of Agnolo Bronzino and Jacopo da Pontormo. Bronzino made his fame portraying the Medici family. His daring portrait of Cosimo L de'Medici, shows the austere ruler in armor with a wary eye gazed to his extreme right, in sharp contrast to most royal paintings which show their sitters as benign sovereigns. El Greco, who trained in Venice for twelve years, went in a more extreme direction after his arrival in Spain, emphasizing his "inner vision" of the sitter to the point of diminishing the reality of physical appearance. One of the best portraitists of 16th-century Italy was Sofonisba Anquissola from Cremona, who infused her individual and group portraits with new levels of complexity. During the Baroque and Rococo periods (17th and 18th centuries, respectively), portraits became even more important records of status and position. In a society dominated increasingly by secular leaders in powerful courts, images of opulently attired figures were a means to affirm the authority of important individuals. Flemish painters Sir Anthony van Dyck and Peter Paul Rubens excelled at this type of portraiture, while Jan Vermeer produced portraits mostly of the middle class, at work and play indoors. Rubens’ portrait of himself and his first wife (1609) in their wedding attire is a virtuoso example of the couple portrait. Rubens fame extended beyond his art—he was a courtier, diplomat, art collector, and successful businessman. His studio was one of the most extensive of that time, employing specialists in still-life, landscape, animal and genre scenes, in addition to portraiture. Van Dyck trained there for two years. Charles I of England first employed Rubens, then imported van Dyck as his court painter, knighting him and bestowing on him courtly status. Van Dyck not only adapted Rubens’ production methods and business skills, but also his elegant manners and appearance. As was recorded, "He always went magnificently dress’d, had a numerous and gallant equipage, and kept so noble a table in his apartment, that few princes were not more visited, or better serv’d." In France, Hyacinthe Riqaud dominated in much the same way, as a remarkable chronicler of royalty, painting the portraits of five French kings. Velazquez, Pope Innocent X, c. 1650, Doria Pamphilj Gallery, Rome. In Spain, Diego Velazquez painted Las Meninas (1656), one of the most famous and enigmatic group portraits of all time. It memorializes the artist and the children of the Spanish royal family, and apparently the sitters are the royal couple who are seen only as reflections in a mirror. Starting out as primarily a genre painter, Velazquez quickly rose to prominence as the court painter of Philip IV, excelling in the art of portraiture, particularly in extending the complexity of group portraits. Rococo artists, who were particularly interested in rich and intricate ornamentation, were masters of the refined portrait. Their attention to the details of dress and texture increased the efficacy of portraits as testaments to worldly wealth, as evidenced by Francois Boucher's famous portraits of Madame de Pompadour attired in billowing silk gowns. In the 18th century, female painters gained new importance, particularly in the field of portraiture. Notable female artists include French painter Elisabeth Viqee-Lebrun, Italian pastel artist Rosalba Carriera, and Swiss artist Angelica Kauffmann. Also during that century, before the invention of photography, miniature portraits―painted with incredible precision and often encased in gold or enameled lockets―were highly-valued. In the United States, Johm Singleton Copley, schooled in the refined British manner, became the leading painter of full-size and miniature portraits, with his hyper-realistic pictures of Samuel Adams and Paul Revere especially well-regarded. Copley is also notable for his efforts to merge portraiture with the academically more revered art of history painting, which he attempted with his group portraits of famous military men. Equally famous was Gilbert Stuart who painted over 1,000 portraits and was especially known for his presidential portraiture. Stuart painted over 100 replicas of George Washington alone. Stuart worked quickly and employed softer, less detailed brush strokes than Copley to capture the essence of his subjects. Sometimes he would make several versions for a client, allowing the sitter to pick their favorite. Noted for his rosy cheek tones, Stuart wrote, "flesh is like no other substance under heaven. It has all the gaiety of the silk-mercer's shop without its gaudiness of gloss, and all the softness of old mahogany, without its sadness." Other prominent American portraitists of the colonial era were John Smibert, Thomas Sully, Ralph Earl, John Trumbull, Benjamin West, Robert Feke, James Peale, Charles Willson Peale, and Rembrandt Peale. In the late 18th century and early 19th century, neoclassical artists continued the tradition of depicting subjects in the latest fashions, which for women by then, meant diaphanous gowns derived from ancient Greek and Roman clothing styles. The artists used directed light to define texture and the simple roundness of faces and limbs. French painters Jacques-Louis David and Jean-Auguste-Dominique Ingres demonstrated virtuosity in this draftsman-like technique as well as a keen eye for character. Ingres, a student of David, is notable for his portraits in which a mirror is painted behind the subject to simulate a rear view of the subject. His portrait of Napoleon on his imperial throne is a tour de force of regal portraiture. Romantic artists who worked during the first half of the 19th century painted portraits of inspiring leaders, beautiful women, and agitated subjects, using lively brush strokes and dramatic, sometimes moody, lighting. French artists Eugene Delacroix and Theodore Gericault painted particularly fine portraits of this type, especially dashing horsemen. Also noteworthy is Géricault's series of portraits of mental patients (1822–1824). Spanish painter Francisco de Goya painted some of the most searching and provocative images of the period, including La maja desnuda (c. 1797-1800), as well as famous court portraits of Charles IV. The realist artists of the 19th century, such as Gustave Courbet, created objective portraits depicting lower and middle class people. Demonstrating his romanticism, Courbet painted several self-portraits showing himself in varying moods and expressions. Other French realists include Honore Daumier who produced many caricatures of his contemporaries. Henri de Toulouse-Lautrec chronicled some of the famous performers of the theater, including Jane Avril, capturing them in motion. French painter Edouard Manet, was an important transitional artist whose work hovers between realism and impressionism. He was a portraitist of outstanding insight and technique, with his painting of Stephane Mallarne being a good example of his transitional style. His contemporary Edgar Degas was primarily a realist and his painting Portrait of the Bellelli Family is an insightful rendering of an unhappy family and one of his finest portraits. The Realists mostly gave way to the Impressionists by the 1870s. Partly due to their meager incomes, many of the Impressionists relied on family and friends to model for them, and they painted intimate groups and single figures in either outdoors or in light-filled interiors. Noted for their shimmering surfaces and rich dabs of paint, Impressionist portraits are often disarmingly intimate and appealing. French painters Claude Monet and Pierre-Auguste Renoir created some of the most popular images of individual sitters and groups. American artist Mary Cassatt, who trained and worked in France, is popular even today for her engaging paintings of mothers and children, as is Renoir. Paul Gauquin and Vincent van Gogh, both Post-Impressionists, painted revealing portraits of people they knew, swirling in color but not necessarily flattering. They are equally, if not more so, celebrated for their powerful self-portraits. American-born Internationalist James Abbott McNeil Whistler was well-connected with European artists and also painted some exceptional portraits, most famously his "Arrangement in Grey and Black, The Artist's Mother" (1871), also known as "Whistler's Mother". Even with his portraits, as with his tonal landscapes, Whistler wanted his viewers to focus on the harmonic arrangement of form and color in his paintings. Whistler used a subdued palette to create his intended effects, stressing color balance and soft tones. As he stated, "as music is the poetry of sound, so is painting the poetry of sight, and the subject-matter has nothing to do with the harmony of sound or of color." Form and color were also central to Cezannes portraits, while even more extreme color and brush stroke technique dominate the portraits by Andre Derain, and Henri Matisse. Other early 20th-century artists also expanded the repertoire of portraiture in new directions. Fauvist artist Henri Matisse produced powerful portraits using non-naturalistic, even garish, colors for skin tones. Cezanne's relied on highly simplified forms in his portraits, avoiding detail while emphasizing color juxtapositions. Austrian Gustav Klimt's unique style applied Byzantine motifs and gold paint to his memorable portraits. His pupil Oskar Kokoschka was an important portraitist of the Viennese upper class. Prolific Spanish artist Pablo Picasso painted many portraits, including several cubist renderings of his mistresses, in which the likeness of the subject is grossly distorted to achieve an emotional statement well beyond the bounds of normal caricature. Expressionist painters provided some of the most haunting and compelling psychological studies ever produced. German artists such as Otto Dix and Max Beckmann produced notable examples of expressionist portraiture. Beckmann was a prolific self-portraitist, producing at least twenty-seven. Amedeo Modiqliani painted many portraits in his elongated style which depreciated the "inner person" in favor of strict studies of form and color. To help achieve this, he de-emphasized the normally expressive eyes and eyebrows to the point of blackened slits and simple arches. Andy Warhol, Marilyn Diptych, 1962, 2,054 cm × 1,448 cm., (809 in × 570 in), Tate gallery, London. Andy Warhol (1928-1987), made several portraits of Marilyn Monroe and other celebrities during the 1960s and throughout his career. By the 1960s and 1970s, there was a revival of portraiture. English artists such as Lucian Freud (grandson of Sigmund Freud) and Francis Bacon have produced powerful paintings. Bacon's portraits are notable for their nightmarish quality. In May 2008, Freud's 1995 portrait Benefits Supervisor Sleeping was sold by auction by Christies in New York City for $33.6 million, setting a world record for sale value of a painting by a living artist. Many contemporary American artists, such as Andy Warhol, Alex Katz and Chuck Close, have made the human face a focal point of their work. Warhol's painting of Marilyn Monroe is an iconic example. Close's specialty was huge, hyper-realistic wall-sized "head" portraits based on photographic images. Jamie Wyeth continues in the realist tradition of his father Andrew, producing famous portraits whose subjects range from Presidents to pigs.